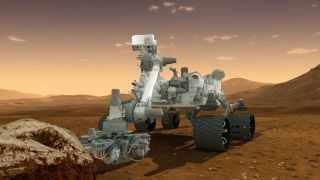 NASA's newest Mars rover, Curiosity, has a tall task ahead of itself when it lands Aug. 6 on the Red Planet. The rover, part of the $2.5 billion Mars Science Laboratory mission, will aim to search for signs that Mars is, or ever was, habitable. Since one of the key requirements of habitability is thought to be the presence of liquid water, Curiosity will seek signs of water buried beneath the Martian surface. To do this, the rover will shove neutrons underneath the planet's surface in hopes that the particles bump against hydrogen, one of the two types of atoms that make up water molecules. Neutrons are subatomic particles that have no electrical charge. When a neutron hits a hydrogen atom, the neutron will slow to a near-stop because the two particles are about the same size. Neutrons have already been used on Mars to find what are believed to be ice reservoirs. In 2002, a high-energy neutron detector aboard the orbiting Mars Odyssey spacecraft found robust evidence of hydrogen on the higher latitudes of the Red Planet, lurking just underneath the surface. From space, it's much easier to use neutrons to seek out water because high above a planet, there are many neutrons, Vasavada said. Closer to the surface, neutrons are so few and far between that MSL must carry its own artificial neutron generator. Provided by the Russian Federal Space Agency, the Dynamic Albedo of Neutrons (DAN) experiment onboard Curiosity will blast 10 million neutrons into the surface with every pulse. These pulses will only take an instant: typically one microsecond, or a millionth of a second. Curiosity can send these pulses out up to 10 times per second. Gale Crater, where the Curiosity rover is supposed to land on Mars, is not expected to have vast tracts of water underground. Maps of the area show possible sulphates and clays in the lowlands. As for water, NASA expects the landing site will have “hydrated minerals,” meaning minerals that have water molecules or hydrogen-oxygen ions stitched into the mineral's crystal fabric. NASA says these minerals can “tenaciously retain water” from a past time when water may have been more abundant on Mars. Water might also be present in a transient form that changes with the Martian seasons, such as soil moisture that can increase or decrease according to the surrounding humidity. Water, whether liquid or frozen, absorbs neutrons more than other substances. The Detector of Albedo Neutrons on the Mars Science Laboratory rover will use this characteristic to search for subsurface ice on Mars. DAN can also help researchers understand the “water cycle” on Mars and compare it with what occurs on Earth. Our planet recycles its water in a continuum between the atmosphere and bodies of water such as oceans, lakes and underground reservoirs. DAN will try to map out the Martian water cycle in conjunction with Curiosity's cameras and its weather station, which can capture properties such as humidity, wind speed, and temperature. Figuring out where the water goes will help scientists understand how the Martian climate works. With a little analysis, this knowledge may just make the search for life a bit easier.